Tag Archive | "Baryancistrus sp." The Snowball Plecostomus (Baryancistrus sp.) LDA33 is another beautiful South American sucker catfish that is indigenous to Brazil’s – Pará, RioTapajós and Rio Xingu. The Snowball Plecostomus is also known by tropical fish keeping enthusiasts as the Snowball Pleco, Big White Spot, Big White Spot Pleco, White Spot Pleco, LDA33, and L142. Baryancistrus sp. 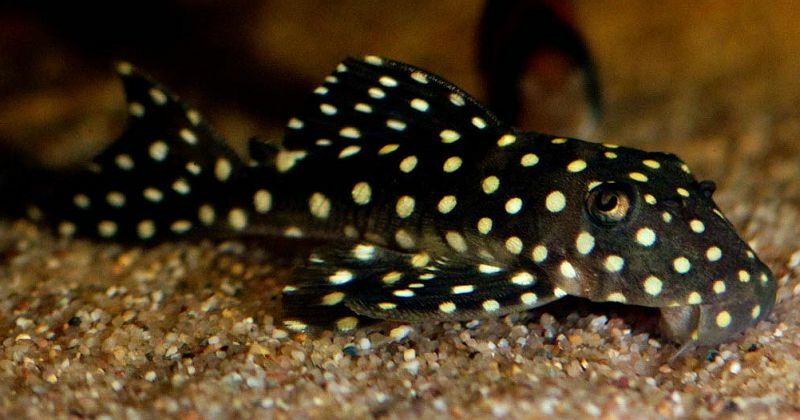 have black bodies with large white to yellowish spots that cover their entire body including their fins. Sexes are difficult to distinguish but males tend to have more pronounced pectoral fins with small bristles than females. Their caudal fins are concave. The Snowball Plecostomus is somewhat territorial with other bottom feeding species, but in a large tank they tend to keep to themselves. The Snowball Plecostomus is a shy, nocturnal species that hides during daylight hours. They acclimate well to aquariums and prefer areas of dense cover away from bright lights. They do best in a relatively large, densely planted aquarium with subdued lighting, a fine gravel or sandy substrate, some driftwood or bogwood , and rock caves for them to hide in during the day. They need plenty of places for them to hide and do best with real driftwood which they feed on in addition to their normal diet. These plecostomus need highly oxygenated water with plenty of water movement to replicate their natural river environment. Along with regular water chang3es, a power head and canister filter should provide the necessary environment to keep them healthy and happy. Avoid extremes in temperature and pH with these fish. 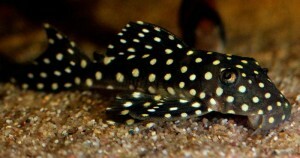 To date the Snowball Plecostomus has never been bred in an aquarium environment. Feeding the Snowball Plecostomus is relatively easy. They do well with a varied diet that includes algae wafers, green vegetables, sinking pellets, live, frozen or freeze dried brine shrimp, tubifex, and bloodworms . Snowball Plecostomus are not common in tropical fish keeping shops and demand a relatively high price when they are in stock. They are usually available as juveniles when they are 1 1/2″ to 3″ long.